Studies have shown that music therapy helps people who suffer with Alzheimer’s Disease or related dementia both cognitively and in movement. At Day Away, a fun part of the day at the weekly program is the Sing Along with participants and volunteers. 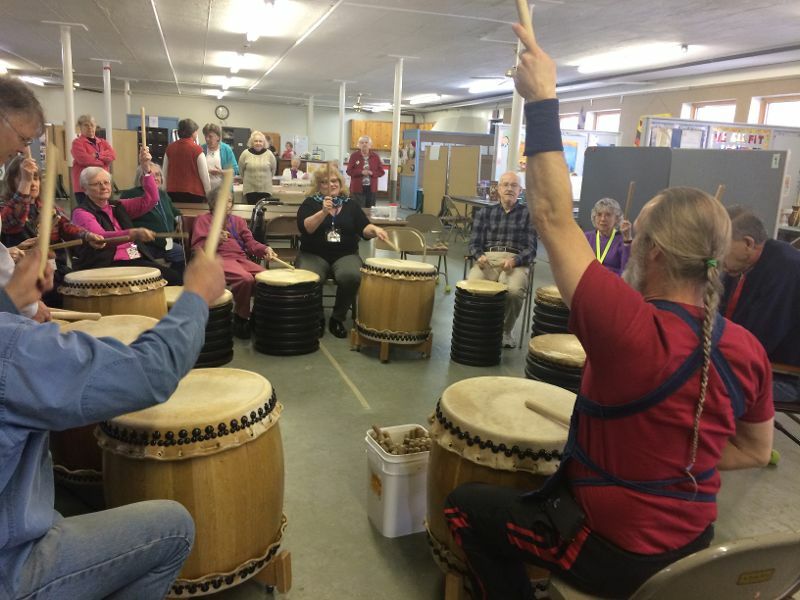 Recently Sensei Stuart Paton of the Burlington Taiko Group of Burlington VT, shared his talents in the ancient art of Taiko (Japanese Drumming). Sensei Paton brought with him various sized drums, and under his tutelage, taught the new artists a short course in this performing art. Respite for Family/Caregivers Day Away is a great way for caregivers to take a break. Day Away is designed to provide a safe and comfortable atmosphere for our participants to help maintain their independence, encourage socialization, be mentally stimulated and remain active. We want to lighten your load. Trained volunteers and an RN director are here to provide 1-1 supervision for your loved one. The day passes quickly and is filled with failure-free activities and much joy for both the participants and volunteers. Day Away is nondenominational and open to all families and caregivers who feel the need for respite and relief from constant care and responsibility.